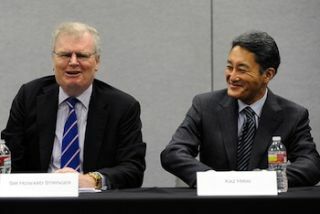 Sony Corporation has named Kazuo Hirai president and CEO, effective April 1, with current chairman, CEO and president Howard Stringer to become chairman of the board of directors in June 2012. In a move that has been speculated upon in the past year, Sony said in a statement that Stringer recommended to the Sony board that Hirai, currently executive deputy president, be his successor as president and CEO. Stringer will continue as chairman of Sony Corporation until his ascension to the board chairmanship, which will become effective upon board approval following the annual meeting of shareholders in June, when the current chairman, Yotaro Kobayashi, will retire. Hirai is also expected to be appointed to the board at the June shareholders meeting. In a statement, Stringer said, "Three years ago, I started to work with the board on succession plans, and in February 2009 we named a new generation of leaders to be my management team. Among them was Kaz Hirai, who had distinguished himself through his work in the PlayStation and networked entertainment businesses. Kaz is a globally focused executive for whom technology and the Cloud are familiar territory, content is highly valued, and digital transformation is second nature. I believe his tough-mindedness and leadership skills will be of great benefit to the company and its customers in the months and years ahead. I look forward to helping Kaz in every way I can so that succession leads inevitably to success. It was my honor to recommend him to the board for the positions of president and CEO, because he is ready to lead, and the time to make this change is now." Hirai said in a statement, "As challenging as times are for Sony now, were it not for the strong leadership of Sir Howard Stringer these past seven years, we would have been in a much more difficult position. I am grateful to Sir Howard and to the board for their confidence in me, and I look forward to working with everyone at Sony more closely than ever before to build a strong future for our customers, shareholders, partners and employees. The path we must take is clear: to drive the growth of our core electronics businesses -- primarily digital imaging, smart mobile and game; to turn around the television business; and to accelerate the innovation that enables us to create new business domains. The foundations are now firmly in place for the new management team and me to fully leverage Sony's diverse electronics product portfolio, in conjunction with our rich entertainment assets and growing array of networked services, to engage with our customers around the world in new and exciting ways."